My children like to copy me when I am praying so obviously they also want to wear a praying hijab. There is not much choice for small children's size hijabs so I now make my own for them from spare fabric that I have. I have in the past made them from cotton, but I much prefer the stretchy fabric as it gives a more comfy fit. 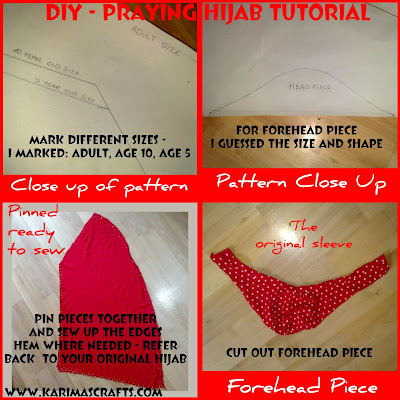 The tutorial for this one is based from a normal sized hijab that most Muslim people will own. However you can make one from scratch by taking some simple measurements making sure that the opening for the face fits the size of your child's face. Also many praying hijabs are 2 pieces but for children this is more complicated and an all-in-one is much easier for them to put on themselves! Paper to make pattern if needed. Step 1: Find out what measurements you need for fabric. Lay out flat a hijab (which is folded) so make sure you double the measurements that are shown on the photograph for your fabric. The photograph shows my hijab size but yours may differ! Step 3: As this is an adult size I measured smaller sizes onto the pattern. To get the smaller sizes all I did was measure with a tape measure around my children's faces to make sure that the opening was the right size. Then just guess a smaller length and width appropriate. Step 7: Sew along the pinned edges, making sure not to sew along the top and bottom openings. Step 9: Cut out the semi circle style shape (you may have to adjust size). This is to cover the forehead. (I used the sleeve part of the dress as this already had a lovely neat hem to it. You now have a lovely hijab for your child. You could even do this for yourself too keeping the adult sizes. 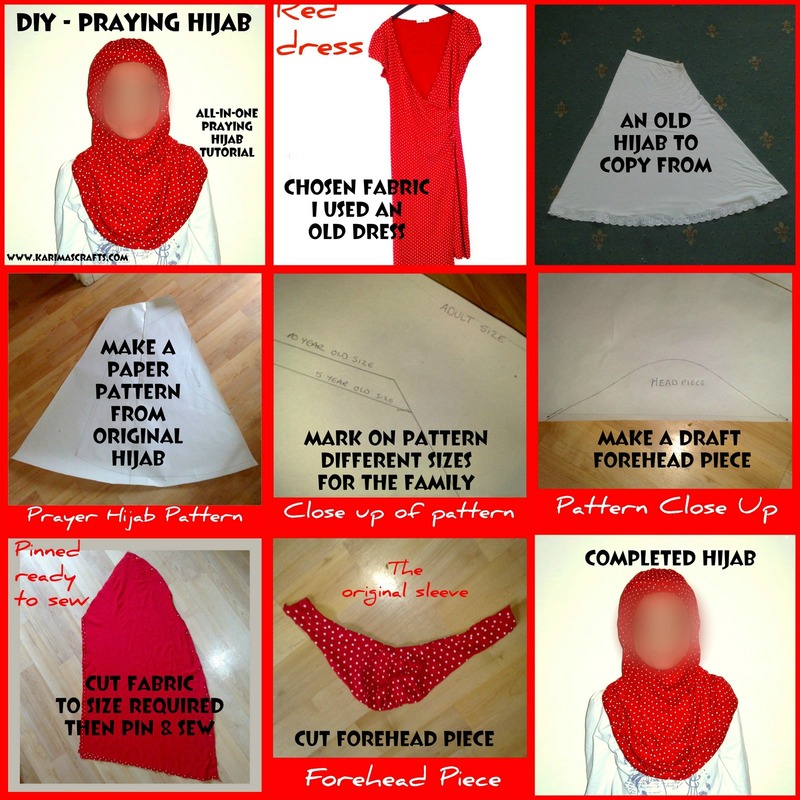 If you don't have a hijab to copy from I posted the measurements in the photograph so you could just try and make a pattern yourself from these measurements. The photograph below is a collage of all the photographs I took. Thank you hope your Ramadan is going well, take care. MashAllah you have some imagination, creativity skills going on there. Thank you - I love sharing my creative ideas with my followers. Glad you like this - these are so easy to make - even by hand sewing! Great idea :D My little Muslim friends always wear the one piece hijab when praying, very easy slip on and off but they are pretty hard to find and I think only purchased online? Yes it is hard to find them here in the UK - that is why I make them myself and at least I can choose fabric my children want to wear - which is normally pink/red/purple! Great idea Karima, it saves money too. Thanks - Yes saving money is a major plus! and the girl in the picture is so beautiful, lovely smile..
Salam, thank you - that is my youngest daughter she is only 5 years old and loves modelling for me! 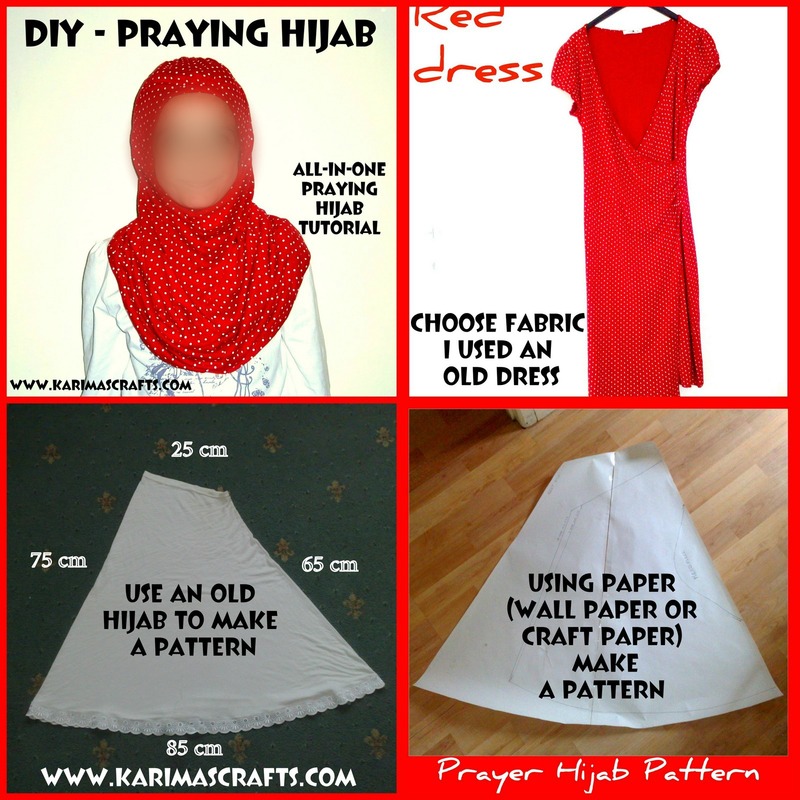 MashaAllah so beautiful & a very smart/easy tutorial..thank you so much for sharing my dear.. Thank you, glad you like it. Hope you are having a great Ramadan. Very nice tutorial, Karima! You are so creative and ingenious! I love that you repurpose things so beautifully. 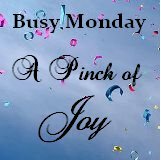 Thanks for sharing on Busy Monday! 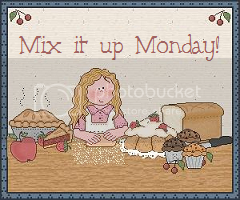 Thank you for your sweet comments - I do love repurposing / upcycling things! This is sooo sweet.. I just love that you made it out of an old dress.. the fabric is lovely and what a beautiful way to pray together! Thank you. I love re-using old clothes especially if the fabric is not damaged! Asalamalaikum, I am happy you enjoyed my post - I do hope you give it a try. My friend tried once and was a bit disappointed with her first attempt but managed it perfectly on the second attempt. Perhaps try with some scrap fabric first if you are unsure.